Some books you read straight through from cover to cover in one sitting. Some books you struggle through over the course of several months, eventually giving up long before the end. Some books require that you consume them in small chewable amounts. 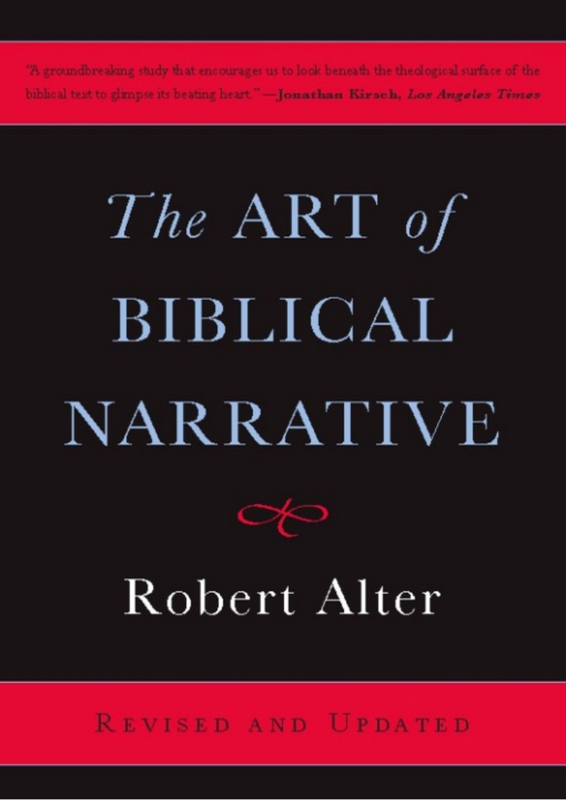 The Art of Biblical Narrative by Robert Alter is of the last variety. And it’s not because the book is so hard to understand. Except the first couple of chapters, you could breeze through this 250 page work in a few days. The problem is that Alter’s perspective is going to feel like sandpaper scrapping across your eyes. If you don’t receive it in small doses, you will run the risk of rejecting Alter altogether without allowing his arguments to sink in. For instance, how many of us would agree with these statements? “Indeed, an essential aim of the innovative technique of fiction worked out by the ancient Hebrew writers was to produce a certain indeterminacy of meaning, especially in regard to motive, moral character, and psychology” (12). “There is no point, to be sure, in pretending that all the contradictions among different sources in the biblical texts can be happily harmonized by the perception of some artful design” (21). I didn’t take those quotes out of context. Alter literally asserts that meaning in the Hebrew Old Testament is meant to be shape-shifting and developing. He asserts that there are contradictions–intentional contradictions–in the Old Testament. He really does approach the Bible as historicized prose fiction (or fictionalized history, at times). And yet I think this is possibly the best book I have read about biblical narrative in the Old Testament. How can this be, since I am a…Southern Baptist? By literary analysis I mean the manifold varieties of minutely discriminating attention to the artful use of language, to the shifting play of ideas, conventions, tone, sound, imagery, syntax, narrative viewpoint, compositional units, and much else…” (13). In the ensuing chapters, Alter encourages us to celebrate the text as it exists. What is the author/redactor/editor/whatever-you-want-to-call-him trying to communicate with the final edition of his work? This approach seeks to avoid the dismissive arrogance of modern scholarship by assuming the writers of Hebrew Scripture actually did know what they were doing in piecing together their story. As I mentioned before, Alter argues that we should approach biblical narrative as historicized fiction, or fictionalized history. In the pages of the Old Testament we witness “the vigorous movement of biblical writing away from the stable closure of the mythological world and toward…the ambiguities of a fiction made to resemble the uncertainties of life in history” (30). These narratives mirror true life–with all of it’s mixed motives, uncertainties, unresolved conflicts, and multiple possible interpretations. Alter explains that the messiness of fiction preserves the theological “tension between the divine plan and the disorderly character of actual historical events…[and the] tension between God’s will, His providential guidance, and human freedom, the refractory nature of man” (37). At the close of this second chapter–the hardest chapter to swallow–Alter explains that by approaching the OT as fiction, it allows “latitude for the exercise of pleasurable invention for its own sake, ranging from ‘microscopic’ details like sound-play to ‘macroscopic’ features like the psychology of the individual characters” (53). After laying a foundation, Alter moves to explaining the features of the biblical landscape. In chapter 3, he explains the importance of the type-scene. For instance, two cowboys in the main dusty road of a western town facing off at high noon–this is a familiar type-scene. The degree to which an author makes use of a recognized type-scene and the degree to which he “breaks the mold” can allow for insight, foreshadowing, and nuance. Alter also explains how Hebrew authors employ Lietwortstil–“the use of reiterated key words or key roots to advance and refine the thematic argument” (75). It is important to understand how narrative and dialogue work together in Hebrew narrative. In general, what is said is more important than what happens. When the author allows characters to dialogue, it reveals how they respond to events and actions. Narrative’s purpose is to summarize or chronicle events, while dialogue sets a scene (94). The typical bibilical narrator exercises restraint, not imposing “an obtrusive apparatus of authorial interpretation and judgement. The Hebrew narrator does not openly meddle with the personages he presents…” (110). Chapter 5 was perhaps the most helpful, because it addressed the elephant in the room: “Repetition is, I would guess, the feature of biblical narrative that looks most ‘primitive’ to the casual modern eye” (111). Rather than faulting the Hebrew narrators, Alter teaches us to see the nuance and beauty in biblical repetition. Biblical writers learned how to use repetition to communicate “commentary, analysis, foreshadowing, thematic assertion, with a wonderful combination of subtle understatement and dramatic force” by creating slight and “strategic variations in the pattern of repetitions” (115). There are five primary categories of repetition: Lietwort (discussed above), motif, theme, sequence of actions, and type-scene. When things are repeated in the Bible, even the slightest variation is meant to contribute to the plot, theme, and direction of the narrative. In Chapter 7, Alter addresses contradictions head on. He explains that the composite artistry of say, Genesis 1 and 2–where two contradicting narratives are set beside one another, is not an example of authorial incompetence but of authorial artistry. Unlike most modern scholars who assume the ancient author was too dense to recognize glaring discrepancies in his own narratives, Alter assumes the author did recognize the descrepancy, and he put it their for a purpose. Two narratives of the same event can communicate more than one account. He compares it to the artist Picasso: “The decision to place in sequence two ostensibly contradictory accounts of the same event is an approximate narrative equivalent to the technique of post-Cubist painting that gives us, for example, juxtaposed or superimposed, a profile and a frontal perspective of the same face” (182). I do not presume to judge whether a literary text may even be thought to have an absolute, fixed meaning (though that is surely unlikely), but I certainly reject the contemporary agnosticism about all literary meaning, and it seems to me that we shall come much closer to the range of intended meanings–theological, psychological, moral, or whatever–of the biblical tale by understanding precisely how it is told. Alter has reawakened my appreciation for the beauty of biblical narrative. Throughout my summary, I have omitted the powerful illustrations from the biblical text where Alter demonstrates his interpretive techniques. He takes apart the stories of David, Ehud, creation, Saul, and Joseph in ways that help you to see how these elements are used. If you read this book only to learn Alter’s nuanced perspective on these narratives, it would be worth it. This book is not for the faint of heart. You will disagree with Alter in many places. One great hurdle to get over is Alter’s insistence on the Bible being “fiction”. As a Christian, I believe the events of the Bible actually did happen. For Alter, whether they happened or not is of no importance. What matters is the text before us. In a sense, he is right–the biblical narrative is all we have. However, I do not think that we have to abandon the historicity of the narrative to appreciate the aspects of the text. Additionally, it is important to realize that in Alter’s mind “fiction” is a genre concept that does not necessarily mean “false” or “imagined”. I would not recommend this book to a new believer. The first two chapters are extremely arduous, but perseverance through them is greatly rewarded in Alter’s incredibly insightful tools and concepts. However, if you enter his book with an unclear understanding of biblical historicity, Alter’s belabored incredulity toward the historical truth of biblical narrative could be discouraging and misleading. For scholars and Christians studying the Old Testament, this book is a must read. In fact, I believe many of Alter’s concepts are readily applicable to New Testament narrative, especially since the writers of the NT live and write in the traditional foundation of the OT. Next Post Should Christians Gamble?